Blissfully large and quite a unique villa with spacious interiors and large flat garden for relaxing and chilling! This unique villa has 6 bedrooms and caters for 12-14 guests. It was built in the 90s and offers a large luxury family home with mature gardens and private pool. The villa is located within walking distance to the seafront, a children’s park, the golf club and one of Sitges best Catalan restaurants. The large wooden doored entrance of this villa gives way to beautiful open hallway with huge ceiling to floor windows extending almost half the width of this house with views onto the pool & garden. There is a very definite sense of space, light and grandiosity about this villa. The Master Suite of this villa on the ground floor is impressively large with its own terrace onto the garden & pool area, a raised living area, an open plan bathroom with Bath and Separate shower and dressing rooms with wardrobe. More like an apartment within the villa. On this floor is another double bedroom with ensuite Bathroom. The spacious hall leads us towards the open plan living room which connects with the outdoor area through sliding doors and further on the dining room which faces the back garden and also connect with the terrace outside with exterior living area. As you would expect, there is a fully equipped kitchen - not as modern as some of our more modern homes but with everything you would need to cater for your group. There is an indoor dining area on the main floor and the house boasts a large BBQ area and al fresco dining also. Imagine your private chef getting the BBQ ready while you sip sundowner cocktails by the pool…. To the back of the kitchen there is a twin bedroom with an unsuited shower room and on the top floor are 4 spacious double bedrooms and an additional open plan area perfect for reading a book or just hanging out or where 2 extra guests might sleep on the sofa bed. One of the unique features of this house is the Bodega tucked away on the basement floor... It’s cool interiors offers a perfect place for summer indoor dining when the hot summer sun has become enough. Another unique feature in Sitges is a villa with a flat garden and this villa has a huge beautiful mature manicured garden surround Located in the Terramar neighbourhood of Sitges, this villa is within walking distance to the beaches and so no need to stress about parking at the seafront in the busy days of Summer. 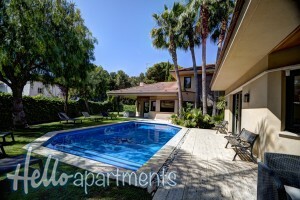 You are also within walking distance to the Golf Club, the Terramar gardens and one of Sitges finest Catalan restaurants. Although in theory you can walk to Sitges, we still recommend a car if you stay at this villa. d a car to get around. Layout Ground Floor Bedroom 1: Large Master King Size Suite with living area, open plan bathroom & separate shower room & huge dressing rooms with wardrobe space. Bedroom 2: Double Bedroom with En-suite Bathroom Bedroom 3: Twin Bedroom with adjoining Shower Room Also on this floor is the open plan living/dining / hall area, the kitchen and access to two separate terraces and waypoint to pool and gardens. Second Floor Bedroom 4: Double Bedroom with Ensuite (shared through separate doors with Bedroom 5) Bedroom 5: Twin Bedroom with Ensuite (shared through separate doors with Bedroom 4) Bedroom 6: Double Bedroom with Ensuite Recreational Area On this floor is a large open plan recreational area with a number of different sofas, One of which is a comfortable sofa bed. Outside There is a large pool surrounded by a flat garden. The kids will love the playhouse which at times is even used for exciting camping experieces. There are two terraces in this villa, one outside the living area and the other which is accessed from the dining area.